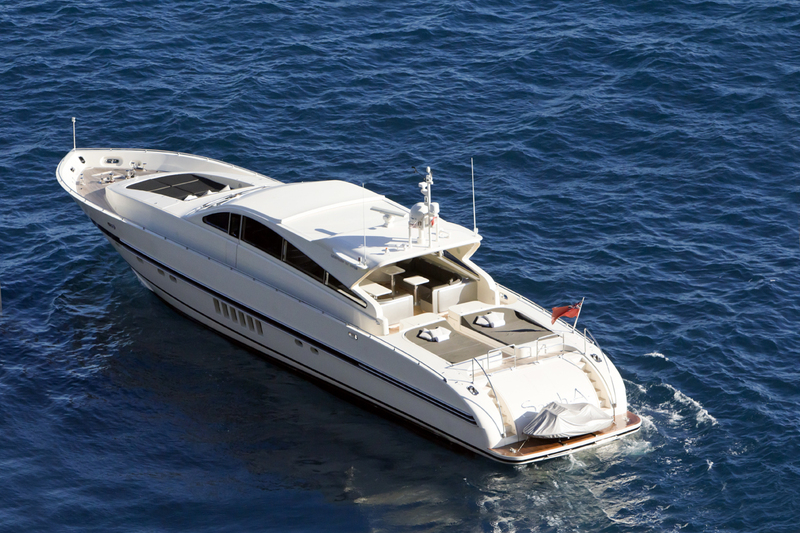 Motor yacht SARAH A is a Leopard Arno measuring 27.1 meters (89ft), this sleek yacht can accommodate 7 guests in 3 cabins and is available for charter in the West Mediterranean. 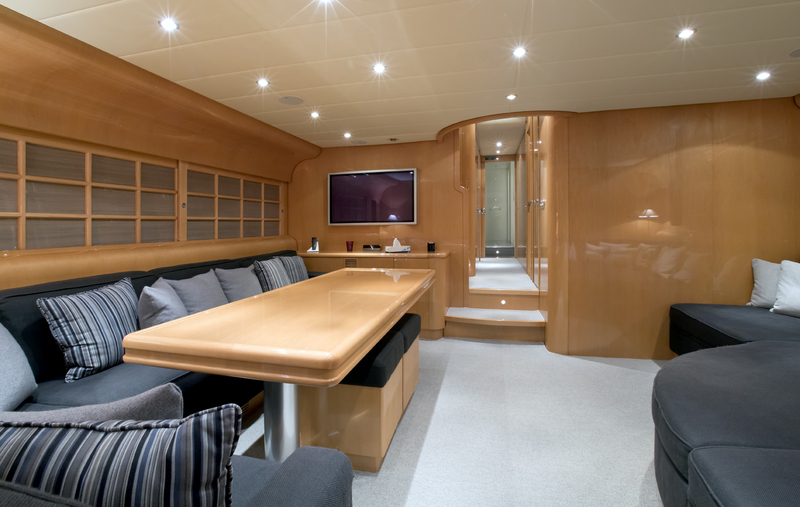 Luxury M/Y SARAH A has a modern yet warm feel, the interior features a simplistic neutral décor with lovely warm tones of honey woods, the salon offers a large sofa and indoor dining space. 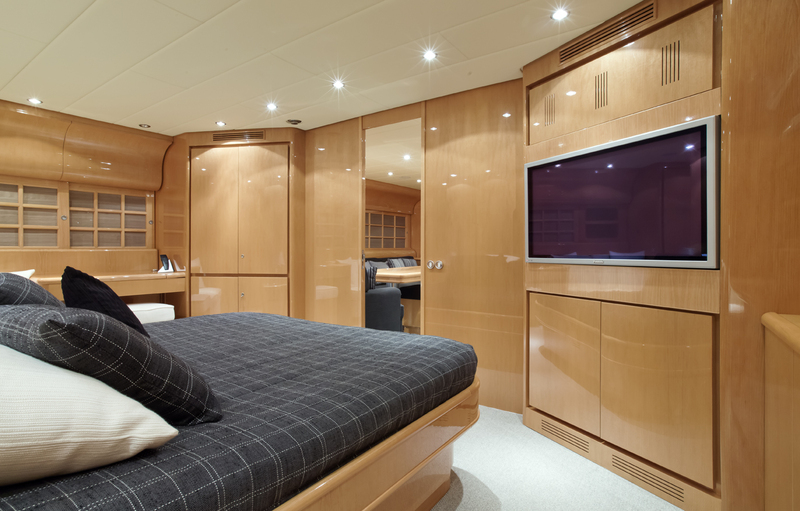 The Leopard Arno yacht SARAH A can sleep up to 7 charter guests in 3 cabins including a large master stateroom located amidship with private bathroom, one double cabin to starboard and one twin cabin to port with additional 3rd Pullman berth. 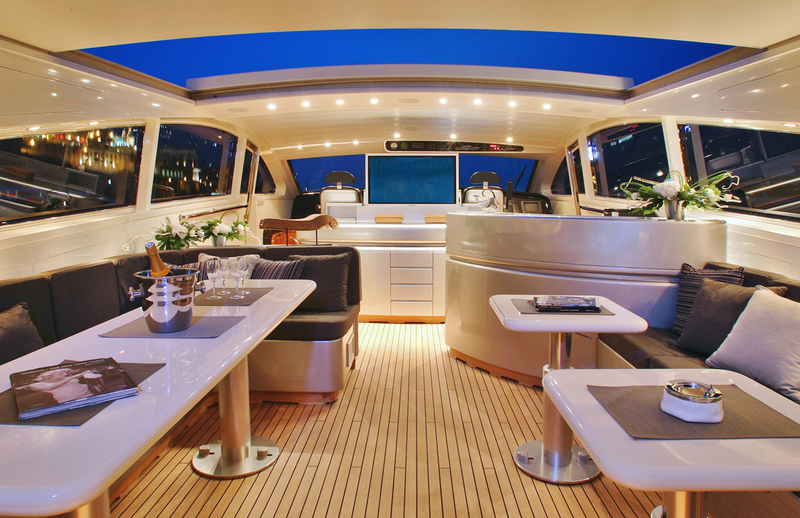 An indoor / outdoor cockpit area can be also utilized as a second salon and dining space on deck featuring 2 cocktail tables, a dining table, ample seating, a retractable roof, wet bar and pop up flat screen TV. 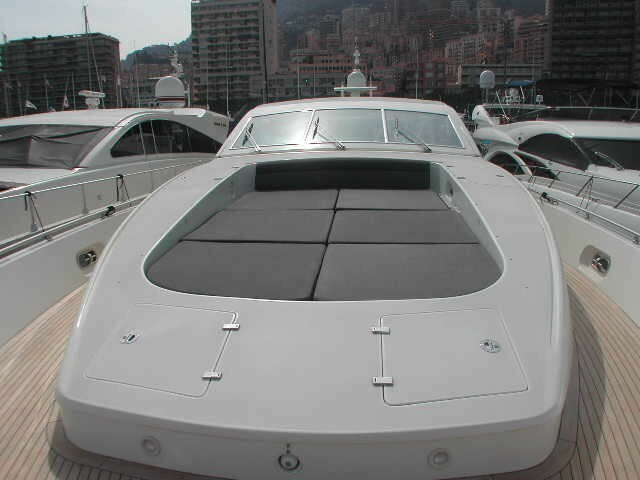 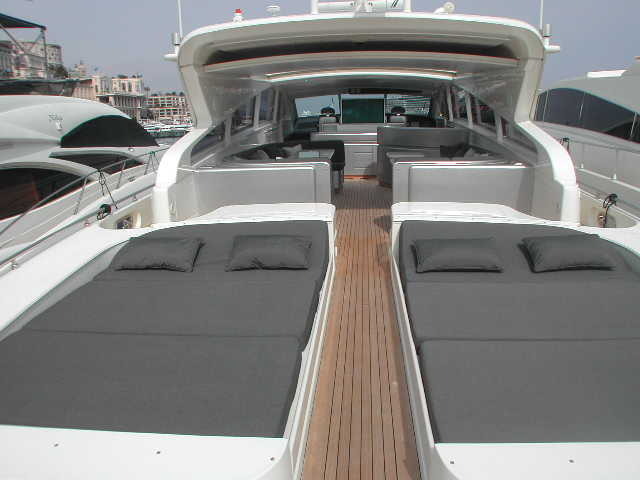 The cockpit opens up and continues with 2 large double sunpads and swim platform, a further more private large sunpad is forward. 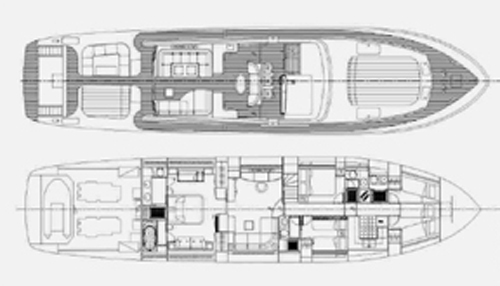 Charter yacht SARAH A has a beam of 6.1 meters (20ft) and draft of 1.5 meters (5ft), this high speed yacht cruises comfortably at 30 knots, making her a good choice for exploration. 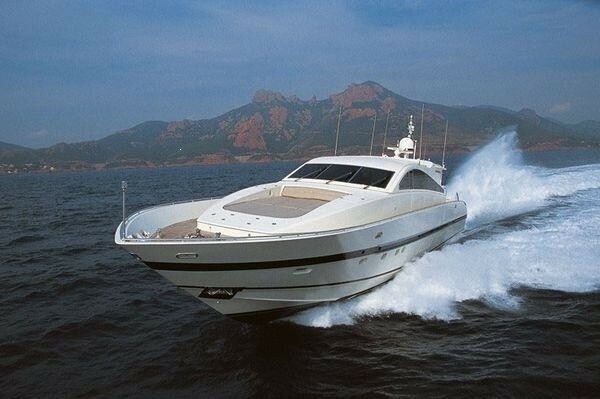 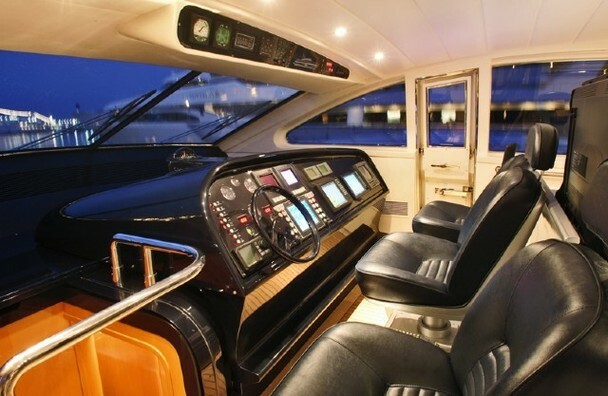 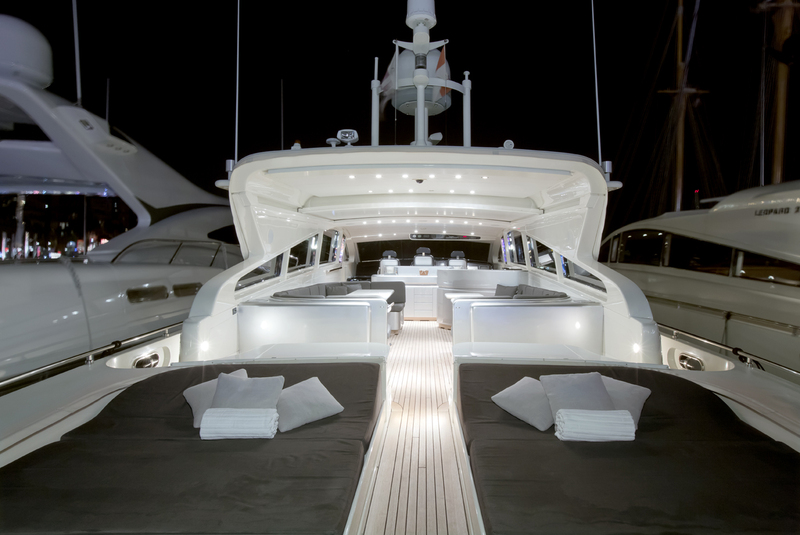 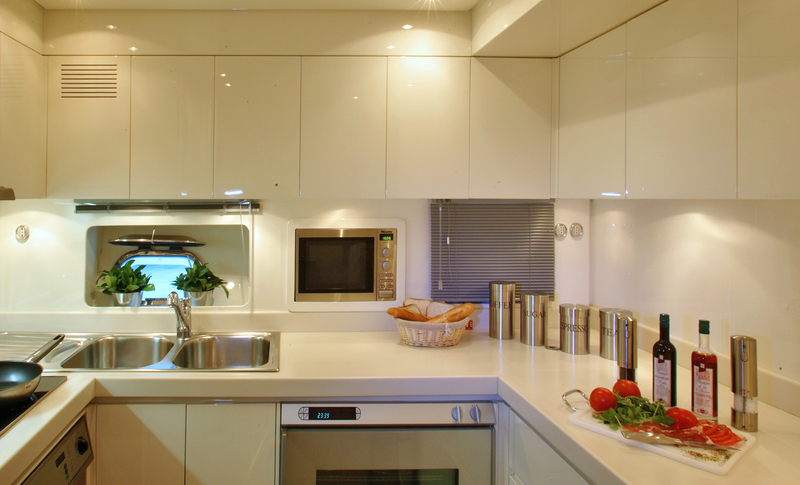 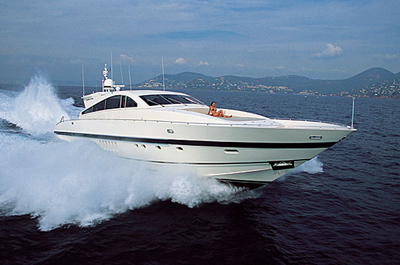 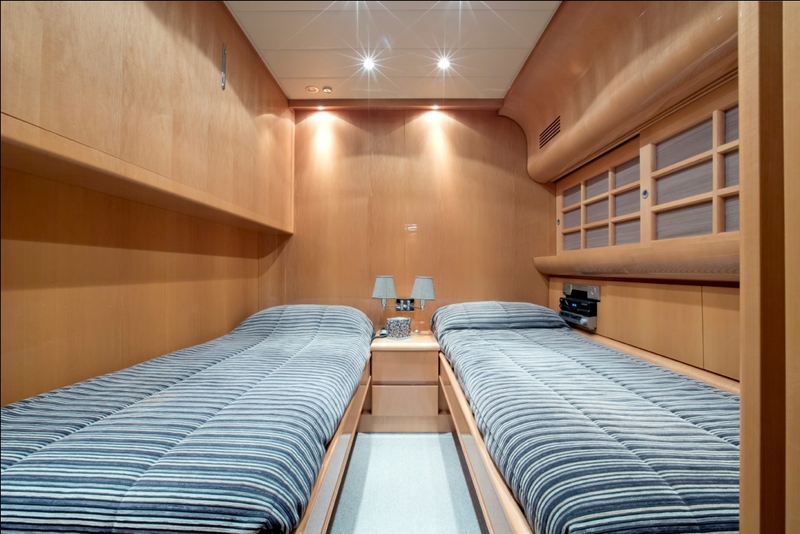 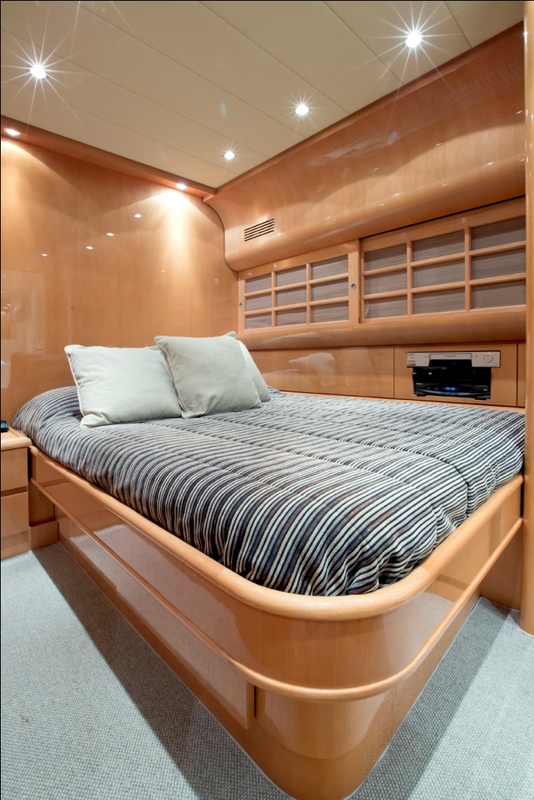 The SARAH A motor yacht is able to accommodate up to 7 guests in 3 cabins. 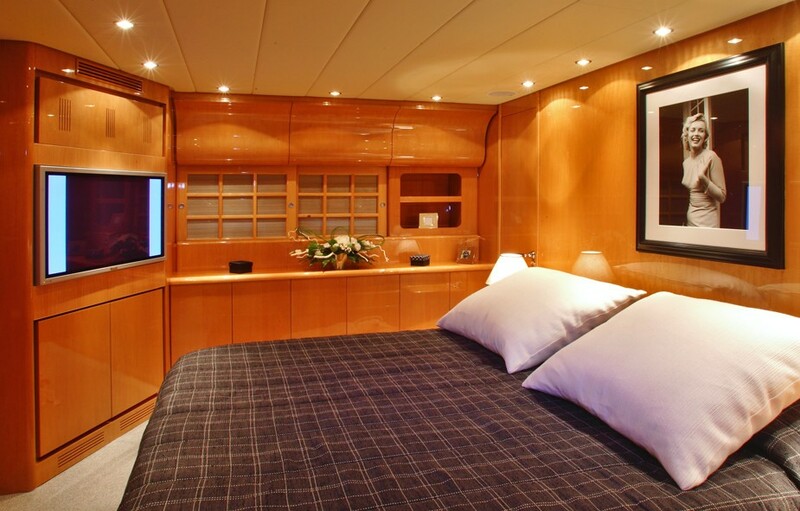 The large master stateroom is located amidship with private bathroom. 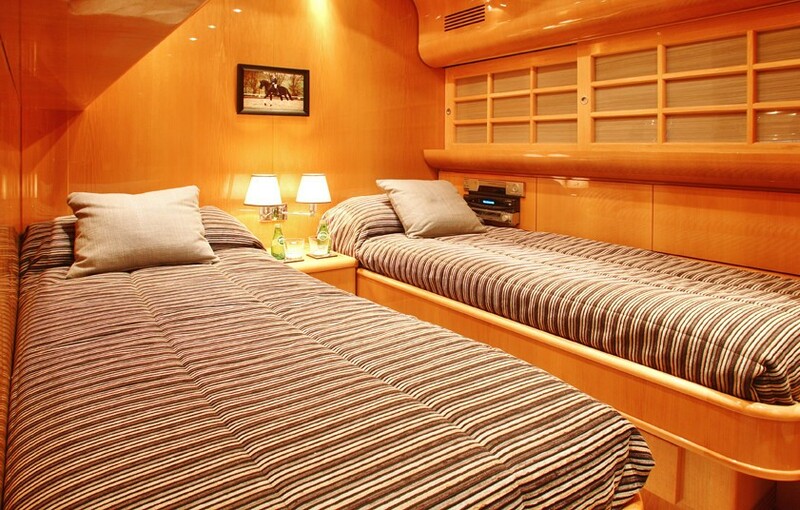 There are two additional guests staterooms, one double (starboard) and one twin (port) with additional 3rd Pullman berth. 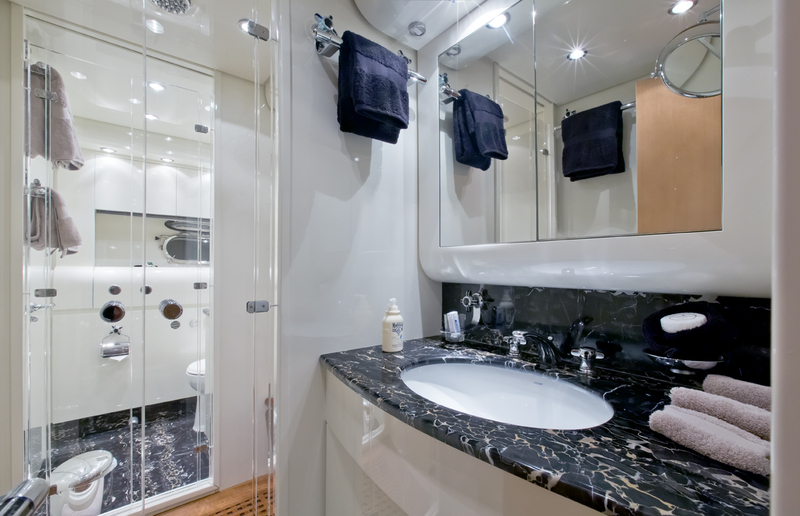 Each cabin has en-suite facilities. 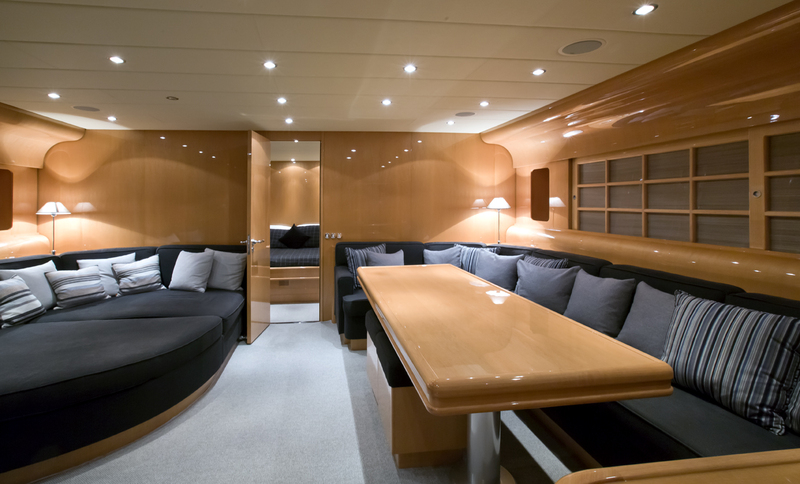 There are separate crew quarters for captain, stewardess and deckhand. 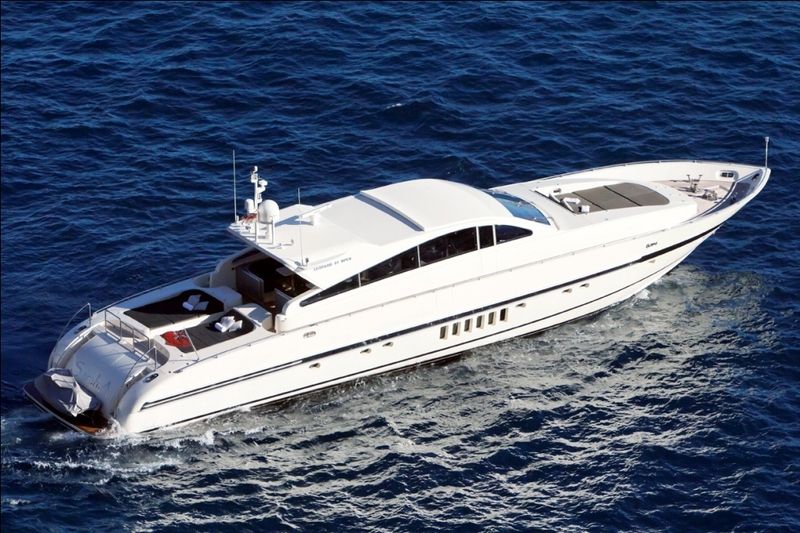 M/Y SARAH A has the follow extras and ameneties onboard for charter guests to enjoy: Tenders & Toys: Jet Ski Sea Doo RDXI, Jet Driven Tender Novamarine 350, Water skis, Doughnut, Communications include Satcom Mini M phone, fax, Navtex Receiver, GSM fixed phone with lines in cabins, Audio Visual Equipment and Deck Facilities include Sea-Tel Sat-TV antenna, Complete A/V Entertainment center, 42 Plasma TVs in salon, master cabin and helm deck. 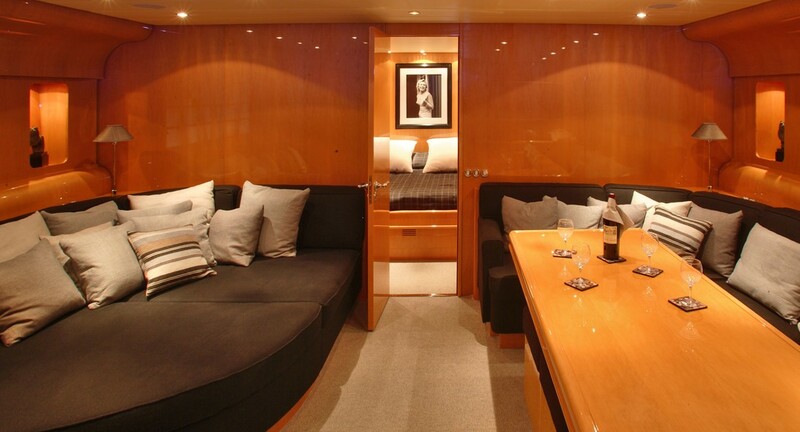 Yacht SARAH A - Lower Salon.